The amber lenses liven cold and harsh LCD computer displays and neon/florescent lighting. Selective filters allow 87% light transmittance so the glasses reduce glare and increase visual comfort. 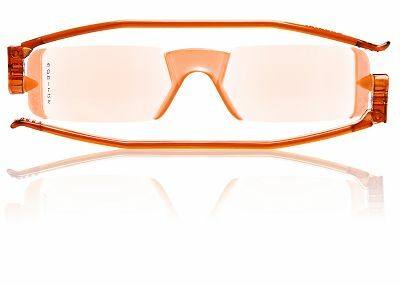 The lenses provide partial UV protection and blue light filtering. Available in two styles in 5 dioptric powers (+1.00, +1.50, +2.00, +2.50, +3.00), or with plain lenses.